Most of the startups these days emerge out of self-necessity and the urge to create a service that would be beneficial to many. This was the same reason why Sushreekanta Mishra started Bookurgift. Ever since he started his career, he was an avid used of online gifting website and found the overall experience to be highly cumbersome. According to him, gifting needs to personalized which was missing from the current gene of online gifting websites. Often considered to be over optimist, he quit his well-paid job to bring his dream to reality. He completed his MCA from Utkal University and his experience as an application developer gave him much credence when it came to starting his own venture. 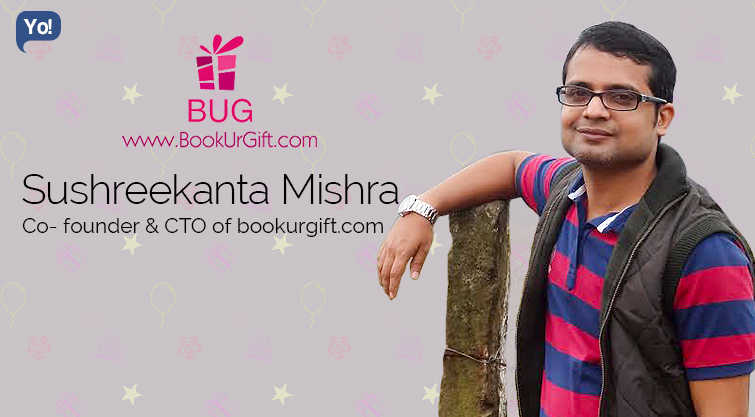 Nowadays, he is fully focused on expanding the reach of bookurgift, and making it a complete gifting solution. BookUrGift deals with online booking and delivery of flowers, cakes, chocolates and gift items all over India. In short it’s a complete gifting solution. I was a regular user of various flower delivery websites. After using many for years, I found there are various problems in this area. No delivery, late delivery, no actual same day delivery, high prices and inaccessibility of the customer service are few to name. Then I decided why not build one such website to address these issues and here I am. Don’t let actions of others control your behaviour. Quitting a well paid job when all set for my long term US assignment. I convinced myself that it’s now or never. No, we have not fetched any investments till now. We have kept it simple. Having less number of employees has provided us ability to focus on each individual’s aspirations. Additionally we have provided them flexibility to work from anywhere and more importantly I have encouraged them to talk to me personally for any reason. I think that works. I use google apps like google sheets, google forms extensively. Using my smart phone to do most of the day to day tasks which enables me to do my job while travelling to places for other works. e.g. I don’t have to just sit in the office because I have to join a skype talk sometime. Dream, Chase, Fall and Rise. Repeat till you fall no more. Never be afraid to quit when the time comes. Expanding BookUrGift to have the delivery capacity in the rural areas of India, where no such service is available till date and also expanding to get into international markets. I would keep my focus fixed on my dream. There is no such favorite as such. I love any place far from the maddening crowd and noise of the city.